Berylline Hummingbird: Endemic of southern and western Mexican foothills and highlands; occurs in southeastern Arizona as a stray, where it occasionally breeds. Inhabits oak and pine woodlands and edges, oak scrub and clearings, plantations; in U.S., forested canyons of desert mountains. 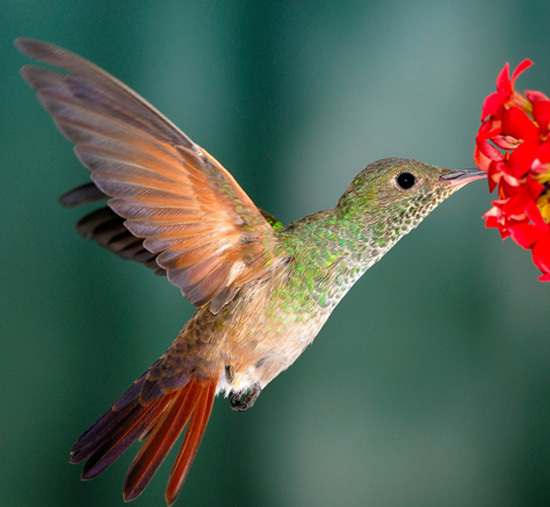 The Berylline Hummingbird is native to Guatemala, El Salvador, Mexico, the United States and Honduras. This bird has a range of more than 600,000 square kilometers around the world. It is estimated that there could be as many as 5 million individual birds. Within the last few years there has not been any evidence that the population of the Berylline Hummingbird is in danger of decreasing. Currently, the Berylline Hummingbird has a rating of Least Concern. This is downgraded from a Lowe Risk rating in 2004. Some sources list them as an accidental species, since its members apparently do not breed regularly in the US. The Berylline Hummingbird is among the rarer of southeastern Arizona's hummingbird strays, and is much sought after by visiting birders. They are most likely to be seen at hummingbird feeders in wooded mountain canyons, such as Madera Canyon or in the Huachuca or Chiricahua mountains. A group of hummingbirds has many collective nouns, including a “bouquet", "glittering", "hover", "shimmer", and "tune” of hummingbirds.